Dream CPC is a Amstrad CPC 6128 emulator for Dreamcast. Dream CPC is freely distributable as soon as the original readme file is in the distribution. b) either in the program or the documentation you acknowledge that "Amstrad has kindly given it's permission for it's copyrighted material to be redistributed but Amstrad retains it's copyright." CPC BASIC is copyright Locomotive software. -	Add a variable sound quality and auto frame skip : if the emu can’t ‘still in time’, it down sound rendering quality and add frame skip to try keep a constant frame rate. Not really perfect because most game doesn’t need this trick to be full speed and game with pbm (Robocop …) near more than the time gained with this trick …. Best than nothing: /. -	Update the Z80 core with the latest PC-CPC core. In the menu, you can move the cursor with the D-Pad and use A button for selection. You can select the options/text in the windows by click (A button) on it. In the disk windows, you can explore the CD (cd), the Ramdisk (rd) or the PC (if the emu run with a coder cable). When you choose a .dsk or .zip file, the disk is inserted and the Amstrad CPC files are automatically listed. If you select a file, the emulator will reset and autos launch the file. You can also back to the emulation, without reset the Amstrad with the joystick icon. In the Pad mapping windows, you can change the default key mapping of the emulator. Select the PAD to change on the top of the windows (the edited one is in red). Click on the key of the PAD you want to change: the key will show ‘???’. 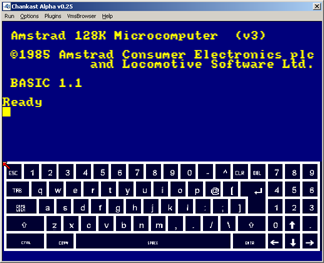 Then select an Amstrad key to associate on the virtual keyboard. You can change the localisation of the Amstrad CPC rom (UK, French and Spain are included). You must reset the emulator if you want the rom change. Keep virtual KB open : in the emulation mode, you use the left trigger to open the Virtual KB. With this open, you don’t need to keep the trigger pressed to show the KB (try it, you will understand ;) Sound: on/off (easy) Show statistic: show few things on the screen like the frame rate Hardware graphic filter: the PVR filter is add when the screen is draw on the screen. It can be useful when the screen is stretched. Screen auto size: automatically choose the best stretch for the Amstrad CPC mode. You can also choose a stretch manually. Show the virtual KB with the Left trigger and move the cursor with the Digital PAD. To select a key, use the right trigger. Press Start when the virtual KB is open to back to the menu. -	The |CPC games don’t auto launch. You must launch yourself. -	Sometime, the auto launch don’t launch the right file : You must launch it yourself.